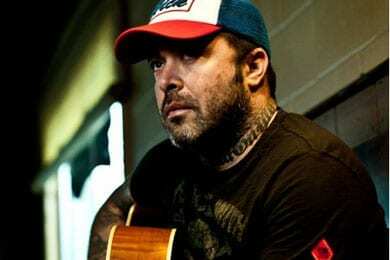 Aaron Lewis has revealed details for his upcoming full length release, which follows his successful 2011 solo EP Town Line and Gold single “Country Boy.” The Staind frontman turned solo country artist will release his new album The Road on June 26 via R&J Records. R&J President James Stroud is once again in the producer’s chair for The Road, which includes the current single “Endless Summer.” Lewis wrote every song on the 10 track collection, except for “Grandaddy’s Gun” which was penned by Dallas Davidson, Rhett Akins, and Bobby Pinson, which marks the first time Lewis has recorded outside material for an album. Full track listing is below. Lewis is currently offering a free download of his song “Red, White & Blue” here. Additionally, Lewis is nominated as artist and co-producer for ACM Awards Vocal Event of the Year for “Country Boy,” along with his collaborators George Jones and Charlie Daniels. The song’s video has racked up over 15 million views to date on YouTube.